South and North Korea are set to hold high-level talks this week to arrange key agenda items for next week's summit amid keen attention over whether the historic meeting could set the stage for the North's denuclearization. Officials from the two sides will discuss themes for the April 27 summit between President Moon Jae-in and North Korean leader Kim Jong-un. If held, it will be the third inter-Korean summit, following meetings in 2000 and 2007. Kim is also set to become the first North Korean leader to cross the tense inter-Korean border since the end of the 1950-53 Korean War. 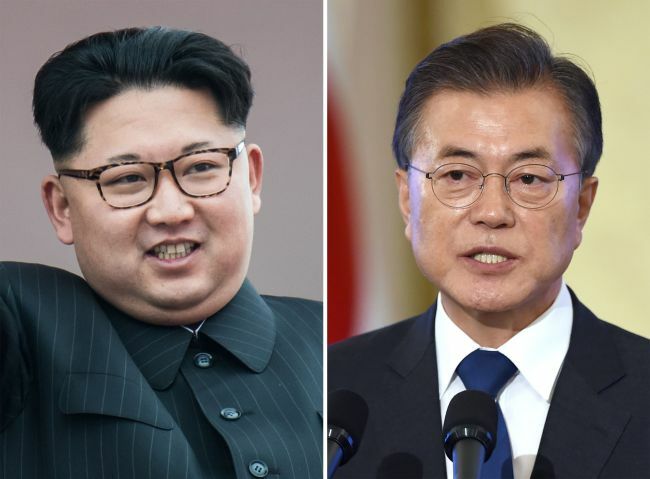 The government has said that the main agenda items for the summit will likely be North Korea's denuclearization and ways to set up a peace regime on the Korean Peninsula and an improvement in inter-Korean ties. "The April summit will be the start of a great journey to denuclearize the Korean Peninsula, bring peace to the peninsula and develop inter-Korean ties," Unification Minister Cho Myoung-gyon said at the high-level talks held on March 29. Top priority will be placed on how to make North Korea abandon its nuclear programs. The upcoming summit will be followed by a meeting between US President Donald Trump and Kim as early as May. The North has conducted six nuclear tests since 2006, including the most powerful one in September 2017. The repressive regime has also fired three intercontinental ballistic missiles, which experts say could reach the US mainland. Pyongyang reportedly suggested a need for phased and synchronous measures for denuclearization, but the US is calling for the North to dismantle its nuclear program in a complete, irreversible and verifiable manner. North Korea has a track record of reaching nuclear deals with the US and others, but later reneging on the agreements including the Sept. 19 accord, under which the North agreed to dismantle its nukes in exchange for a security guarantee and energy. "If North Korea attaches conditions for denuclearization and drags its feet, it will be hard to expect a successful summit between Trump and Kim. This could raise fresh military tensions on the peninsula," Shin Beom-chul, a senior fellow at the Asan Institute for Policy Studies, said in a report. At the inter-Korean summit, the Koreas need to reach "comprehensive agreements" on steps which the North should take for denuclearization and ways for a security guarantee that Seoul and Washington can provide the North, Cho Sung-ryul, a senior researcher at the Institute for National Security Strategy, told a forum last week. He said that the US and North Korea could later seek to reach a package deal that includes details about North Korea's denuclearization and Washington's corresponding rewards. Experts said that at the summit, the Koreas need to agree on ways to ease military tensions. Possible areas for discussions include holding military talks on a regular basis and reducing military tensions at the border. South and North Korea remain technically at war as the Korean War ended in a truce, not in a peace treaty. The Demilitarized Zone that bisects the peninsula is a 4-kilometer-wide strip of rugged no-man's land stretching from coast to coast and is one of the most heavily fortified zones in the world. "Before starting discussions on a peace regime, it will be good for the Koreas to reach ways to make the DMZ a full-blown demilitarization area in order to ease tensions under an armistice scheme," Shin said. Meanwhile, the government said that ahead of the summit, it is exploring ways to improve ties in a sustainable manner and under international sanctions. "One issue is how to institutionalize sustainable inter-Korean relations. The other is what can be done under the sanctions regime (to develop ties)," Minister Cho told reporters on April 9. When the two Koreas held summits in 2000 and 2007, they unveiled landmark joint declarations on reconciliation that included ways to boost economic cooperation. But Seoul cannot provide massive economic benefits to North Korea any more as international sanctions are aimed at curbing inflows of hard currency to the regime. Experts also said that South and North Korea should resolve humanitarian issues, including families divided by the Korean War and six South Koreans detained in the North. At the high-level talks held on Jan. 9, Seoul and Pyongyang failed to agree to hold reunions for divided families. Seoul places priority in resolving the issue as more aging Koreans have passed away without being able to meet with their kin on the opposite side of the tense border. But in exchange for reunions, the North demands Seoul return 12 female North Korean workers who worked at a restaurant in China and defected to South Korea en masse in 2016.